Homeless Korean War veteran Thomas Moore, 79, speaks with Boston Health Care for the Homeless coordinator Romeena Lee last November in Boston. The number of homeless veterans in the United States has fallen 33 percent since 2010, to just under 50,000 as of January. The number of homeless veterans sleeping in the street, as opposed to in shelters, fell even faster, down nearly 40 percent over the past four years. At least those were the figures put out by a trio of federal agencies in a news release Tuesday. When I first saw the numbers, I was more than a little skeptical. A change that dramatic often reflects a shift in the way data is collected or some other statistical quirk, not a trend. Moreover, the Obama administration has every incentive to make the numbers look good, especially at a time when the Department of Veterans Affairs is mired in scandal. I’ve looked into the numbers, though, and it seems my skepticism was misplaced. 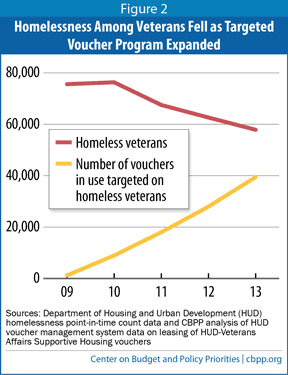 The number of homeless veterans really does seem to be falling. What’s more, it’s falling at least in large part due to government intervention. Here at FiveThirtyEight, we had a few theories about how the numbers could be misleading. My first thought was demographics: Vietnam veterans are starting to qualify for Social Security and Medicare, which might be helping them get off the streets. In that scenario, the decline in homelessness is real, but it isn’t anything for which the Obama administration can claim credit. In a similar vein, DataLab editor Micah Cohen wondered whether the post-2010 decline was more about the improving economy than any policy shift. My colleague Carl Bialik, meanwhile, offered a more pessimistic theory: Maybe this year’s unusually cold winter artificially reduced homelessness counts by driving people indoors. None of those explanations turned out to hold much water. Carl’s is the easiest to debunk (sorry, Carl): The number of homeless vets has been falling pretty steadily for the past four years, so this wasn’t a one-year blip driven by cold weather. The same goes for the number of “unsheltered” homeless veterans, who were presumably the ones most affected by the icy winter. Micah’s theory about the economic recovery is harder to reject because good data on the number of homeless veterans only goes back to 2009. But we have data on overall homelessness going back to 2007, before the recession began. Those figures show that homelessness didn’t increase much during the recession, ticking up only slightly in 2010. In general, the number of homeless Americans has been trending down, but not nearly as quickly as the number of homeless vets. There’s no particular reason to think that the recession would have disproportionately hurt veterans, or that the recovery would have disproportionately helped them. So it’s unlikely that the recovery is the only thing helping vets. As for my theory, it’s possible that demographics are playing some role, but they don’t appear to be the primary explanation. The government’s main annual report on homelessness doesn’t usually include any demographic information, but the 2011 report did provide a basic age breakdown of veterans in homeless shelters. (It doesn’t have data on veterans living on the street.) About 10 percent of them were 62 or older, and 42 percent were between 51 and 61. A report from the nonpartisan Congressional Research Service in November also looked at data from the VA’s programs for homeless vets. Those sources found that between a quarter and a third of homeless vets served during the Vietnam era, but that even more – about half – served in the post-Vietnam, pre-Gulf War era. More recent veterans, meanwhile, make up an additional 20 percent or so. So, while there are indeed lots of homeless veterans entering their 60s, there isn’t the kind of big post-Vietnam drop-off that could explain the recent decline in homelessness. What’s really going on? According to Will Fischer, an analyst who has written about the issue for the left-leaning Center on Budget and Policy Priorities, this is a case of a government intervention that worked. In recent years, the federal government has vastly increased spending on housing assistance for veterans, mostly in the form of direct housing vouchers. Just to make sure I wasn’t missing anything, I also called the National Coalition for Homeless Veterans, an advocacy group that presumably has no incentive to minimize the problem. It said it considers the government’s official figures reliable.